ISIS-linked news agency says group was behind two rockets fired from Sinai Peninsula into southern Israel. The Islamic State (ISIS) group has claimed responsibility for two rockets fired from Egypt's Sinai Peninsula into southern Israel on Sunday night. The rockets hit the Eshkol Regional Council late on Sunday, but exploded in open regions without causing physicals injuries or damages. The jihadist group claimed responsibility in a statement on its Amaq propaganda agency, saying the attack "targeted a Jewish community with two Grad missiles". While most of the rocket attacks targeting southern Israel originate from Gaza, Sinai-based jihadists have several times fired rockets toward the area as well. Last December, ISIS claimed responsibility for firing two missiles from the Sinai Peninsula at an Israeli border crossing, which landed in Egyptian territory. 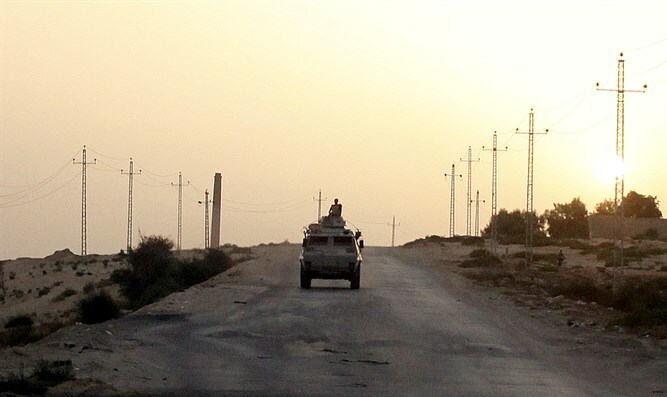 ISIS-affiliated jihadists in the Sinai have been fighting an intense insurgency against Egyptian forces, with hundreds of troops and policemen killed since the army ousted former Islamist president Mohammed Morsi in 2013. Sunday's rocket fire came hours after six Egyptian soldiers were killed in an ISIS attack in northern Sinai. Following the attack, Egypt announced that it would not be reopening the Rafah border crossing with Gaza as originally planned.